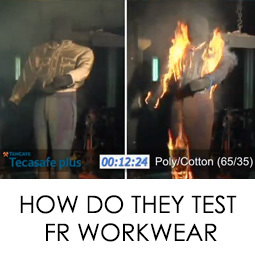 How do they test FR Workwear? Every day, workers around the world are risking their lives as they are exposed to the risk of flash fire, electrical arc flash and molten metal splash. In the split second when such a dangerous situation does occur, providing the right FR clothing can make the difference between avoiding a disaster involving serious injury, or death. In a matter of seconds, a momentary electric arc, flash fire or molten metal splash exposure can surround a worker with searing temperatures that will ignite everyday non-flame resistant workwear instantaneously. Worse yet, non-flame resistant workwear continue to burn even after the source of ignition has subsided. In fact, the majority of severe and fatal burn injuries are due to the ignition of non-flame resistant work clothes - not by the actual exposure to the heat source itself. Using flame resistant clothing can provide the necessary thermal protection to shield workers at the moment of exposure. Once the source of ignition is removed, flame resistant garments will self extinguish, greatly limiting the severity of a burn. In many cases, they can mean the difference between a minor accident and a tragic fatality. With the growing need for standard FR Workwear on many worksites there are many reasons to check the quality and safety of the materials and fabrics used to construct many existing Workwear products. The following tests analyse fabrics through standard tests used to certify and categorise the safety ability of FR Materials. Arc Thermal Performance Value - ATPV is the exposure energy on a material that results in a sufficient heat transfer through the material for a 50% probability of the onset of a 2nd degree burn. An ATPV rating is assigned to FR clothing to indicate the level of protection provided. Hazard Risk Category - HRC is a rating range directly related to ATPV. There are 5 HRC's ranging from 0 to 4, with a hazard risk of 0 presenting the least risk and a hazard risk of 4 being the greatest level of risk. TenCate Tecasafe® plus is engineered to provide unbeatable electric arc and flash fire protection that lasts longer than FR treated cotton fabrics. Tecasafe® plus is soft and lightweight fabric providing unmatched comfort. It is also comforting to know that Tecasafe® plus's inherent protection will never wash or wear out. Inherently flame resistant FR properties are built in, and won't wash or wear out. Exceeds NFPA 70E HRC 2 and NFPA 2112 performance standards. Comfortable to wear Soft, flexible and breathable. Specially engineered to provide excellent moisture management properties that keep the wearer cooler by naturally wicking moisture away from the skin. Exceptional durability Outstanding abrasion resistance and better strength retention after multiple commercial washes. Excellent value Long life cycle and competitive price means lower cost of ownership. High Visibility AS/NZS1906.4, ANSI 107 and CSA Z96 compliant. Earth Friendly Made with Lenzing Tencel® environmentally friendly cellulose fibre. the durability and endothermic properties of nylon for long wear life and improved flame protection. Walls FR® has changed the way people think about protective clothing, delivering comfort, protection and wear life never before thought possible in a single fabric. In fact, Walls FR® fabrics deliver the best protection combined with the lowest cost per wearing in the industry. Walls FR® now has added softness that delivers the full potential of cotton comfort. PROBAN® is a chemically treated Cotton fabric designed to protect the wearer from a range of workplace hazards such as arc flash, flash fire, molten ferrous metal splash, exposure to welding and wildland firefighting. The PROBAN® process ensures the fabrics are guaranteed for flame resistance for the life of the garment, provided recommended wet laundering or dry cleaning procedures are followed. ALu- SAFE® is a unique high performance workwear fabric developed specifically and especially to protect workers in Primary Aluminium Smelters who are exposed to the hazards and dangers of molten aluminium and cryolite (reduction cell flux) splash. ALu-SAFE® also offers protection from hazards such as radiant and convective heat and electric arc. Elliotts Quality Safety Gear includes FR Workwear using materials designed for each condition and industry. This includes Tecasafe plus and Walls FR workwear along with Nomex, PBI, Proban and Tecasafe Gemini Firefighting apparel. Learn more about FR Testing, Material Data and the Elliotts FR Range and many other safety products available at elliottaustralia.com.